A Beef Shawarma So Good You'll Be Craving More! You haven’t lived until you’ve had Beef Shawarma! One of those food items I saw on every street corner in Vancouver but admittedly was too afraid to try for many years. I fell in love with a good shawarma platter several years ago! Shawarma was one of those meals that you went out to have but I’ll be the first to admit that dragging children around to restaurants sometimes can be quite daunting! But Shawarma was never something I could make at home…until NOW! A pressure cooker is going to be your best friend in this instance! I received an Instant Pot for Christmas and have been in complete AWE of all the things this little contraption can tackle! Shawarma at home is very much a real thing now! Shawarma is a Levantine meat preparation, where lamb, chicken, turkey, beef, veal, or mixed meats are placed on a spit (commonly a vertical spit in restaurants), and maybe grilled for as long as a day. Shavings are cut off the block of meat for serving, and the remainder of the block of meat is kept heated on the rotating spit. Shawarma can be served on a plate (generally with accompaniments), or as a sandwich or wrap. 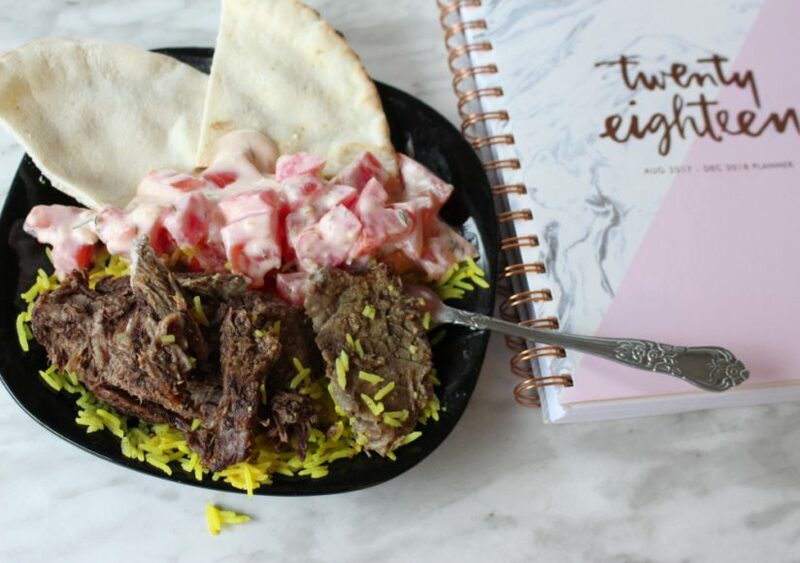 Learn how to make restaurant style beef shawarma right in your pressure cooker! 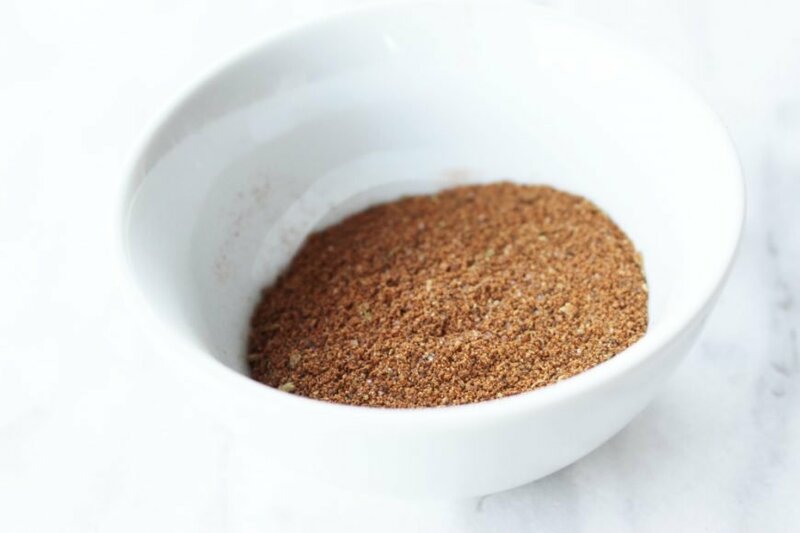 Combine the shawarma seasoning, salt, 2 tablespoons of vinegar, and 1 tablespoon of olive oil in a small bowl. Massage this paste onto the meat evenly on all sides. Cover and refrigerate for min 8 hours. The longer you allow it to sit the better; ideal time is 24 hours. Add the remaining tablespoon of oil to the instant pot on the sauté setting. Sear the meat for about 6-8 minutes turning as required to brown all sides. Add broth and the remaining 2 tablespoons of vinegar to the instant pot. Cover and hit the ‘beef/stew’ button and let cook for 60-65 minutes depending on the thickness of the meat. Allow the pressure to release naturally or turn to the ‘vent’ setting. Shred the meat using two forks. Preheat the broiler and spray a baking sheet with nonstick spray. Add the shredded meat in a single layer to the baking sheet drizzle in 1/4 cup of the juices and place under the broiler for 5-7 minutes keeping any eye on it and tossing with tongs after 2-3 minutes. 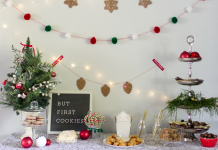 The idea it to crisp *just* the outside. Pro Tip #1: Round bottom roast would be a good substitute for chuck roast. 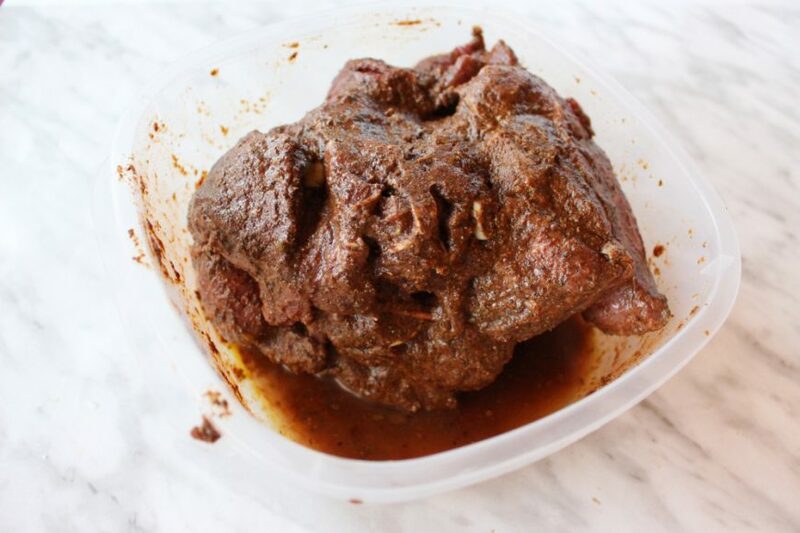 Pro Tip #2: Chuck Roast is not something you will necessarily find at your local grocery store! You will have much better luck with your local butcher! 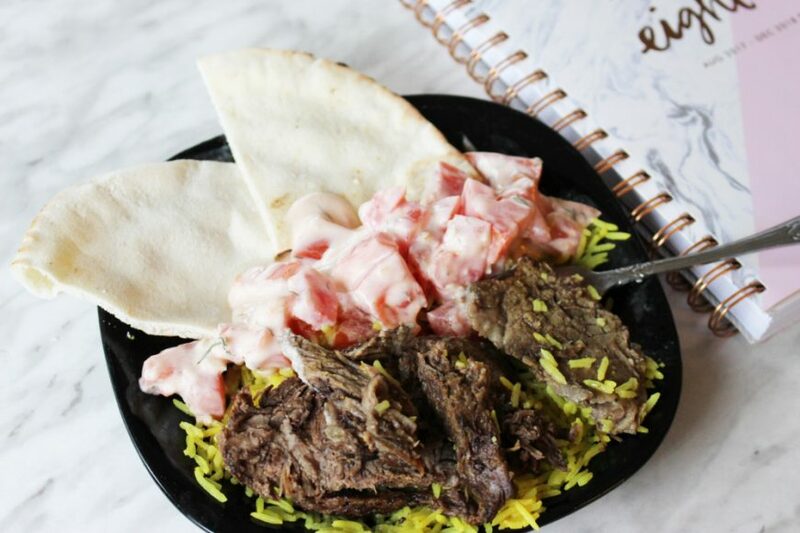 Go on your own culinary adventure by using our beef shawarma recipe to create this delicious dish at home using your Instant Pot or Pressure Cooker! 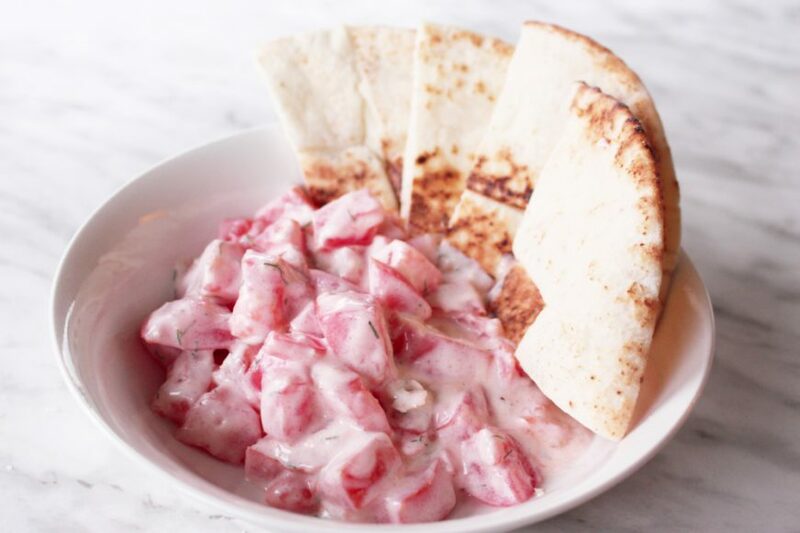 Note: The Recipe for the Shawarma rice and Tomato & Garlic salad is coming next week…. 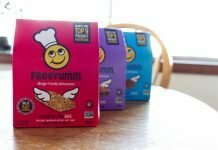 Combine all the ingredients in a bowl or ziplock bag. Store in an airtight container in a cool, dry place. 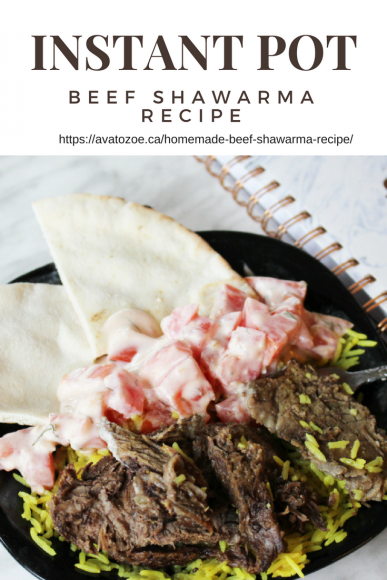 A Delicious Beef Shawarma made right from home that will leave you NEEDING more! 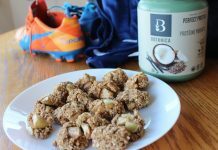 Thanks for sharing this sure looks like a dish I would enjoy !